D-Unit Debuts With "I'm Missing You"
D-Business Entertainment’s much anticipated new female trio D-Unit, featuring members Wooram, Ujin, and Soojin, finally makes their debut onto the K-pop scene with their title track “I’m Missing You.” With the CEO of D-Business being a member of YG’s former hip-hop group YGMA and the producer of “I’m Missing You” known to be none other than Kush, many predicted that D-Unit would be step onto the scene with a strong hip-hop vibe and image. “I’m Missing You,” however, is more of a acoustic-electronica pop fusion single, but it still has proven to be a strong first step nonetheless. 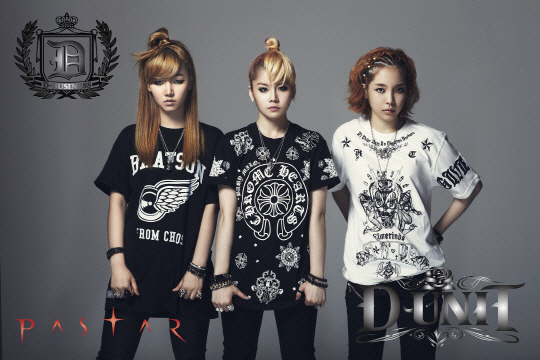 The trio come forward with a angsty bad girl image for this debut, and light up this single with unprecedented charisma. The MV opens with an introduction of sorts, as we meet each member in their own solo shot. I thought it was interesting the way Soojin’s dance shots were layered over Wooram and Ujin’s solo takes–it sets up the song’s darker, more sober themes while still keeping the energy up at a level that matches the song’s tempo. The whole running through the tunnels looking distraught bit was a bit cliche, but the scenes quickly move into choreography against a dark, abandoned-looking industrial set. Altogether, the colors and the sets in the MV are well showcased, and do their part in conveying the emotion and edge in the title track. I also absolutely loved the dance scenes when the girls are in all white on a completely black backdrop. This made both the girls and choreo just pop, and you really get to see just how the clean their dancing is. If I were to complain about anything, it would be that the ending was a bit anticlimactic for such an energized song. Also, while I get the whole bad girl image means playing a bit on the masculine side of style, at least in terms of K-pop, I thought the oversized garments were just a bit much and even a bit outdated, particularly on Wooram, who is already smaller in stature. While the wardrobe wasn’t atrocious by any means, these were just some little things I noticed and couldn’t help but wrinkle my nose. As far as delivery goes, the girls did a phenomenal job in the execution of their choreography. I also appreciated their attitude and aesthetic approach to concept presentation. None of them looked out of place or out of their element, which helped in the establishment of their image in the MV overall. In terms of ingenuity, however, the MV is still fairly standard–it didn’t strike any sort of artistic or intellectual chord, it just seemed like a very predictable set up for an MV. Mind you it wasn’t boring or tasteless, but still not something entirely original either. I will say I was also a little bit bummed to find out their debut single wasn’t going to include more hip-hop and rap influences, as that certainly would’ve been an image that would’ve set them apart from other female debuts by a long shot. Still, “I’m Missing You” has a unique debut flavor and unique debut concept for a female trio, so I can appreciate at least that much. Be sure to catch D-Unit’s debut on the music stage and take a look into their music for yourself, as they seem like promising female rookies. “I’m Missing You” is definitely one of the those songs of addictive nature, and it is sure to make it on your playlist soon!